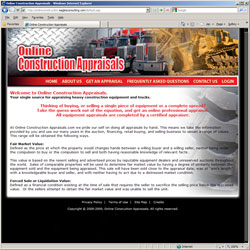 Project scope: Online Construction Appraisals is your single source for appraising heavy construction equipment and trucks. Thinking of buying, or selling a single piece of equipment or a complete spread? Take the guess work out of the equation, and get an online professional appraisal. All equipment appraisals are completed by a certified appraiser. Design components: New site design consisting of all graphics, site layout. Shane Soroka Equipment Co. L.L.C.